Mint : Myriandros (Alexandria ad Issum) although Price does discuss some possibly problems to the attribution to this mint. Date : Price dates this type to between 325 and 323 BC, fully within the lifetime of Alexander. Size : 27.3 x 26.3 mm. Weight : 17.26 grams. Grade : aXF, with good centering on both sides (full ring of beads on the reverse) and very good style for the period. 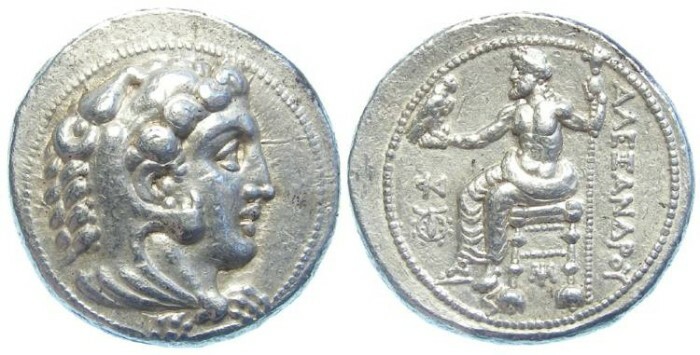 The slightly broader than average flan (also slightly heavier than average, give this coin a very attractive over all appearance and is a very nice example of an Alexander lifetime issue. Reverse : Zeus seated left, holding a sceptre and eagle, with ΒΑΣΙΛΙΩΣ below and ΑΛΕΞΑΝΔΡΟΥ to the right, an MI monogram below the throne and an uncertain monogram and club in wreath below the arm.